Just about everything in your life—food, cars, building materials—comes to Hawaii via the waterfront. We went inside the world of the longshoremen, who load and unload all that cargo, and found that centuries of muscle and sweat have given way to skilled labor and powerful machines. 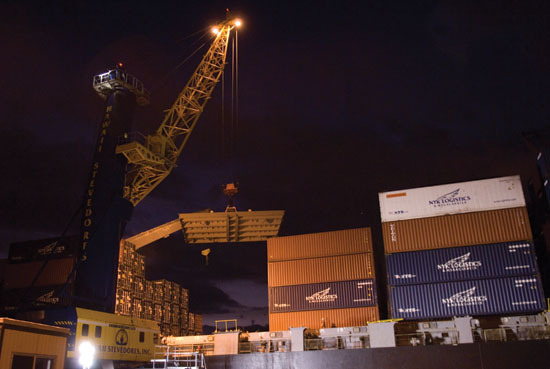 Matson's gantry cranes run all night. Nate Lum and his gang of linemen spread out along the wharf, watching impassively as the Lihue lumbers into dock beneath the gantry cranes at the Matson yard at Honolulu Harbor. The linemen are here to secure the vessel—the first of several gangs of longshoremen who will handle the ship while it’s in port. They’re a motley group, mostly older and thick around the middle; except for their hard hats and orange vests, they’re dressed haphazardly in street clothes. But linemen are among the most experienced longshoremen; the members of this gang have spent decades in the shadow of ships like this one. And the Lihue is a behemoth: a 787-foot containership, crammed stem to stern with that ubiquitous beast of modern freight, the ocean container. These “cans,” as the longshoremen call them, are stacked as many as 12 abreast and 11 deep and tower more than seven stories over the water. And yet, despite its ungainly load, the Lihue docks gracefully. As the harbor tug slowly nudges the stern the last few feet toward the pier, the crew begins to send the dock lines ashore. The linemen collect them methodically, hitching the hawsers—thick as a man’s thigh—to a forklift and snaking them to bollards down the pier. The whole operation takes place almost wordlessly. Containerships like the Lihue have come to dominate ocean freight, accounting for more than 80 percent of the household goods coming into Hawaii. Most of the food we eat, the clothes we wear, the furniture in our homes and, indeed, most of the material in the homes themselves, arrive in containers. 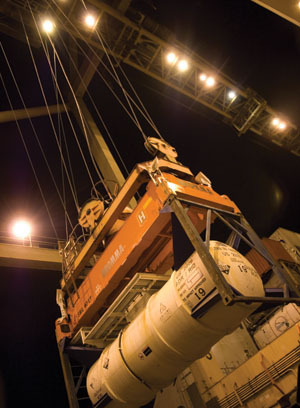 The Matson yard teems with the massive machinery needed to manage the endless stream of cans: gantry cranes and jack cranes, top-picks and side-picks, bomb carts and forklifts. But these are all just tools. It’s still the longshoremen themselves who make the docks work. The waterfront is a world where centuries of muscle and sweat have given way to skilled labor and powerful machines, and I’ve come down to the Matson yard for a glimpse at how things have changed. Nate Lum, foreman of the lineman gang and chairman of the longshoremen’s union, has agreed to be my guide. Lum is a second-generation longshoreman. He’s been on the docks for more than 30 years and embodies many of the contradictions in the modern stevedore. He’s a sober, burly man; but he laughs easily and carries himself with a self-assured grace. Like many accustomed to hard, physical work, he’s taciturn; but he’s passionate about the union and articulate in defense of its traditions. Specialized containers are needed to haul liquids. After getting me a hard hat and an orange vest, Lum and I hop into his truck for a tour of the waterfront. As we drive through the shipyards of Honolulu Harbor, he explains the organization of the longshoremen. In the old days, when the workers were predominately Native Hawaiians, the wharves were lined with great warehouses. Some longshoremen worked the wharf, sorting cargo in the warehouses and carting it back and forth to the ships. Others worked aboard the ships, loading and unloading cargo and securing it for passage down in the hold. Although containers have changed much of the work, longshoremen still operate within the old structure. “Longshoremen are organized into gangs,” Lum explains. “Ship gang. Wharf gang. Machine operators. Crane operators. Linemen.” The modern wharf gang, they move the cans around the yard and man the “puddle”—the loading zone beneath the gantry cranes. The ship gang handles the difficult manual work aboard a ship, locking and unlocking the cans from one another, and lashing and unlashing the stacks. In the early days of container use, workers used chains to lash the stacks against ocean storms. Today, the lashing is done with 20-foot steel rods secured with turnbuckles. The awkward task of scampering between the stacks, balanced on temporary walkways called duckboards, is still considered one of the longshoremen’s most dangerous jobs. “The meat and potatoes of longshore work is this ship gang,” says Lum. Out on the edge of the apron—the broad tarmac that runs along the pier—several members of the wharf gang sit in the shade of the container yard tower, waiting for the unloading of the Lihue to begin. Lum drops me off there to find out how technology has affected regular stevedores. Even here, though, longshoremen often have years of experience. Some, like machine operator Kahea Sanborn, have been on the docks more than 20 years. But the experience runs deeper than that. Carlton Cortez, the gang foreman, is a third-generation longshoreman. A basic “can,” or container, is 40 feet long, eight feet wide and eight feet high. Locking mechanisms at the corners allow them to be securely stacked and moved around by the machinery in the yard. There are variations, specialized containers such as refrigerated cans for food, flat racks for lumber and cattle cans with slatted sides—but they still fit together like Tinker Toys. Containers are also standardized across freight platforms, so the cans from the containerships can be loaded onto semitrailers or stacked two deep on railroad cars. Within the past five years, the cans have also become GPS-equipped; their locations are monitored and recorded on computers in a Matson control room in Salt Lake City, Utah. The most easily recognized feature of the Matson yard is the rank of huge, yellow gantry cranes along the pier. They tower over the docks like the robots in War of the Worlds, their legs spread far enough apart that four lanes of traffic can pass under them. They load and unload the cans from the containerships. High above even the largest containership, the crane’s boom juts out over the water, cantilevered by the weight of its massive machine house. The cab, instead of being fixed, is attached to a trolley that runs on tracks beneath the boom. Shuttling in and out in his cab, the crane operator is always directly over his load. The entire crane rides on railroad tracks along the dock, so it can be moved fore and aft along the ship. Sometimes as many as four cranes work a single ship. A good crane operator can move more than 30 cans an hour in a precise ballet. Lum takes me up to the break room in the back of the Matson yard to meet a handful of crane operators waiting for their shifts to begin. Like the linemen, crane operators have decades of experience—and, in the union, where seniority is paramount, they’re at the top pay grade. It’s a position for which longshoremen have to wait years. I glance at the other crane operators milling around the break room. None of them look like they’re ready to give up their privileged positions, though it can be a lonesome job. Later, each of them will head out to his crane, climb the 10 flights of stairs inside one of the crane’s legs, then spend five hours in his cab, moving cans. They carry a lunch with them, and an old jug usually serves as the latrine. Before the use of cans, cargo was loaded into the ships piecemeal, and stevedores climbed right down into the hold to do it. Cargo was segregated according to its destination port, and the ship gang had to serve as carpenters, too, building bulkheads and frameworks in the ’tween decks to shore up the cargo. Later, surveyors passed through, checking to make sure the shoring would hold. There were no gantry cranes back then. Instead, shipboard jack-cranes crowded the vessel’s deck—sometimes as many as seven to a ship, one for each hold. Cargo—the small stuff packed in bales and boxes and crates, the large stuff left loose—was hoisted in and out of the hold on pallets. Stevedores loaded and unloaded the pallets one by one, using handcarts to push freight around the enormous dockside warehouses. This called for a lot of labor, and, at its height, the longshoremen’s union had more than 4,000 members in Hawaii. Modernization took a bite out of the union, and by the late ’50s and early ’60s, more than 2,000 stevedores were laid off. As Lum points out, “When I got hired in 1970, there were only about 400 longshoremen.” As harbor operations have grown, that number has gradually increased, and today there are about 1,000 longshoremen in the local of the International Longshore and Warehouse Union (ILWU). A visit to a monthly meeting at the union hall reveals a surprisingly diverse group. Most of the longshoremen had to wait a long time before they got their opportunity to join, even starting longshore work as a second career. “We’ve got a lot of athletes,” Lum says. “Got Jesus Salude, the former world flyweight champion. Got football players, too: Elvis Satele, Karl Lorch, Levi Stanley.” And it’s not just athletes who gravitate to the docks; there are also former policemen and ex-firefighters. I look over the meeting hall. It’s a serious day for the union—they’re debating some of the details for their upcoming contract negotiations—and many of the stevedores have crowded their folding chairs toward the front of the room to listen to what the leadership has to say. But there’s also an air of conviviality in the room, and I’m struck by the sense of brotherhood there. During the union meeting, stevedores move in and out of the room, greeting each other with warm embraces. There are still a lot of Native Hawaiians among the longshoremen, and they often pause to honi in the old-fashioned way. When the meeting upstairs finally ends, Lum comes down and introduces me to Karl Lorch, one of the most famous stevedores. He joined the longshoremen after more than a decade as a professional football player with the Miami Dolphins and the Washington Redskins. Lorch knew people at Hawaii Stevedores Inc., one of the two big stevedore companies, so when his football career ended, becoming a longshoreman seemed like a good option. “It’s a hard job,” Lorch says. “But I went to school just to get by and to play football. This is a good job.” The ILWU is still a powerful union in Hawaii, so the wages and benefits are good for the stevedores. Although it’s dangerous work done in all weather, the basic laborer makes $31 an hour. Longshoremen often endure criticism for being overpaid, but, with the hours they work, they don’t make much more than other skilled blue-collar workers, like electricians and plumbers. Still, the longshoremen are sensitive about the subject. Dennis Hollier is a freelance writer with a real fascination for the hubbub of the waterfront. He writes about business, culture, science and the environment, but he can usually be seen staring wistfully out to sea.